This individual is recognized as an innovative thought leader in the technical community who has demonstrated exceptional expertise and contribution in helping others derive greater value from IBM software, solutions, and services. An IBM Champion is an non-IBMer IT professional, business leader, developer, administrator, or educator who influences and mentors others through blogging, speaking at conferences, moderating forums, leading user groups, and authoring books or articles. 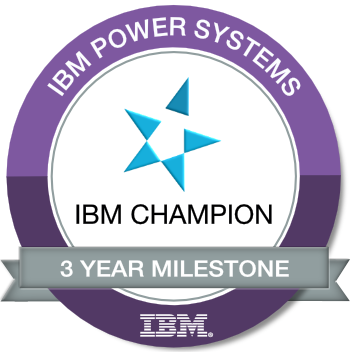 To earn this badge, the individual must be nominated and selected as an IBM Champion for 3 or more years.